by Rob - March 3rd, 2014. 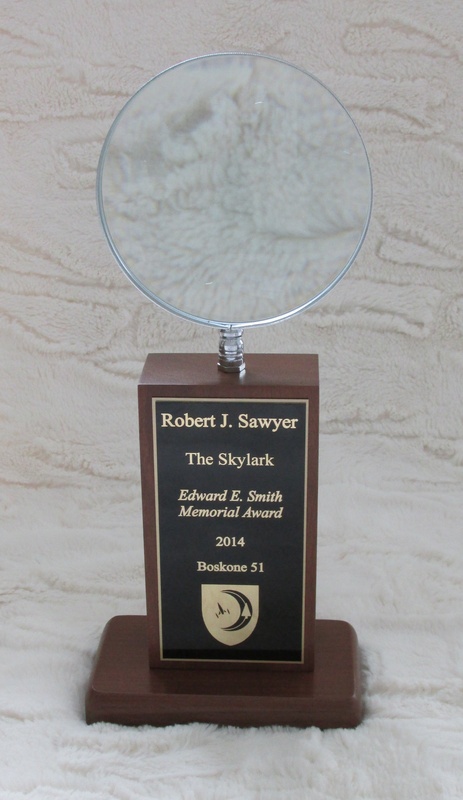 I’m absolutely thrilled to be the 2014 winner of the Edward E. Smith Memorial Award for Imaginative Fiction (the Skylark), presented annually since 1966 by the New England Science Fiction Association (NESFA). The award is given to a person who “has contributed significantly to science fiction, both through work in the field and by exemplifying the personal qualities which made the late ‘Doc’ Smith well-loved by those who knew him.” The gorgeous trophy includes a very powerful magnifying glass, in honor of Doc Smith’s famed Lensman series of novels. The award was presented Saturday, February 15, 2014, at Boskone 51 in Boston. Past winners include authors Isaac Asimov, Larry Niven, Anne McCaffrey, George R.R. Martin, Terry Pratchett, and my Tor editor David G. Hartwell and my Ace editor Ginjer Buchanan.